Peer out of vehicle from outside ground. 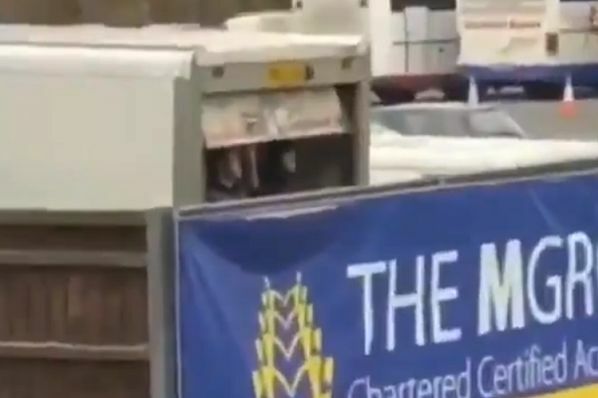 Some Sunderland fans without tickets watched their side’s 1-1 draw with Oxford United from the back of a lorry outside the Kassam Stadium on Saturday. The ticketless Mackems peered out at the action from the rear of the vehicle as Jack Ross’s Black Cats consolidated their 4th place position in League One. It could have been better for them as they led until the 87th minute through Irish defender Jimmy Dunne’s first-half goal. However, Marcus Browne grabbed a late equaliser for Karl Robinson’s U’s, keeping them out of the relegation zone on goal difference. Forthcoming Sunderland matches should prove more accessible for the supporters – their next three fixtures are all at home, against Blackpool, Accrington Stanley and Gillingham.